It takes detailed knowledge of anatomy and	pathophysiology	to	image these three structures well. The pancreas may not always be well seen during an IMBUS exam, but it is important to know where the pancreas lies and to recognize important pathology when it is seen. The curvilinear probe is used with a left lateral decubitus position that moves stomach contents out of the epigastrium and improves a liver acoustic window. The following overall guidelines for pancreatic lesions mesh with the American College of Radiology recommendations. More detail about specific lesions is found further in this chapter. An asymptomatic patient with a cystic mass less than 2 cm on CT is recommended to have an MR in 6-12 months (the shorter time interval for younger patients with greater life expectancy). An IMBUS-observed lesion that is less than 1.5 cm should be observed with IMBUS in several months to verify the size and then intermittently over the next year. At any time the lesion reaches 2 cm, the patient should go directly to MR and MRCP. Focal, hypoechoic solid masses in the pancreas must be presumed to be malignant, probably regardless of size, and should go immediately to MR. 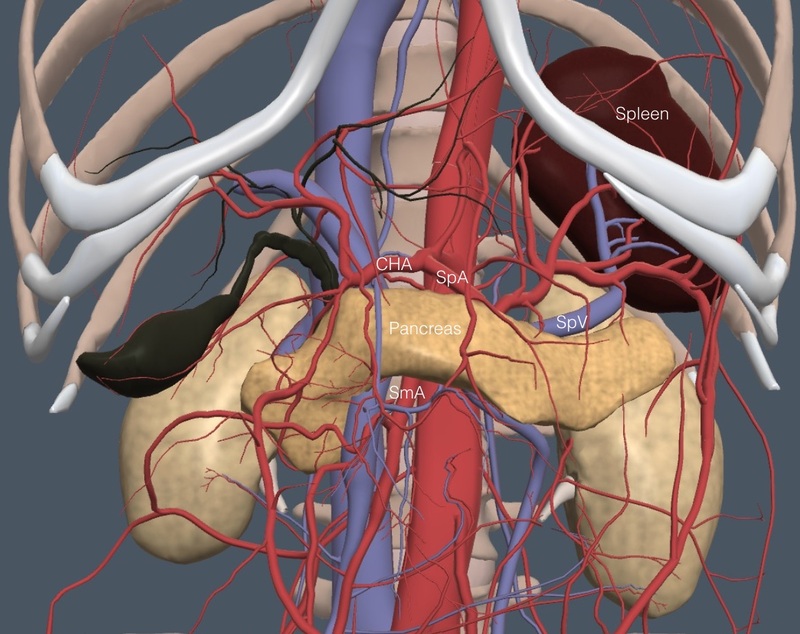 The splenic vein (SpV) is the key landmark to the pancreas, which runs transversely posterior to the duodenum, transverse colon, and stomach. The following anatomy image removes the GI tract structures and shows the unusual shape of the pancreas running from its head at the duodenum transversely through its body and then more posteriorly as the tail runs lateral to the spleen and left kidney. The pancreas is mostly isoechoic with the surrounding tissues. It can be a little hypoechoic in younger patients and more hyperechoic in older and obese patients and it can look a little more “sparkly” than the liver during live viewing. 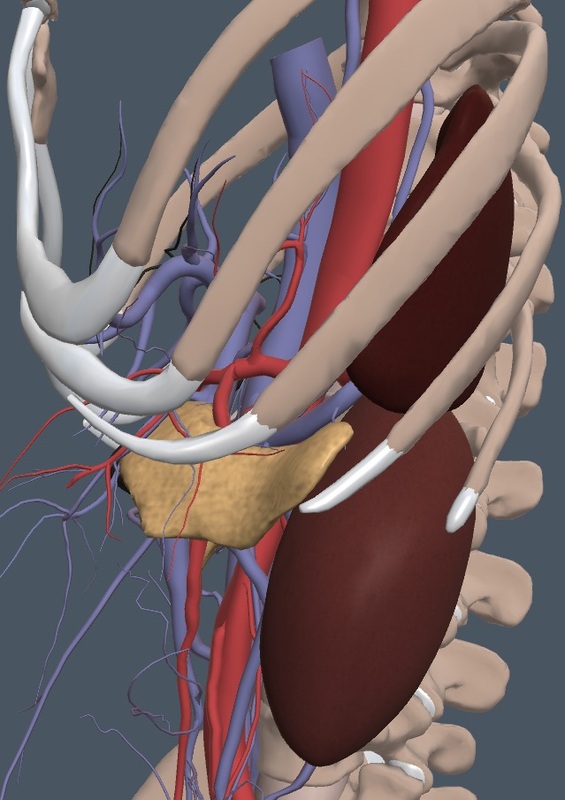 The pancreas lies anterior to the SpV until it is out of view behind the stomach. In obese or gassy patients keep the probe high in the epigastrium and have the patient hold a deep inspiration so the left liver lobe can be the acoustic window through which to scan down to the SpV and pancreas. 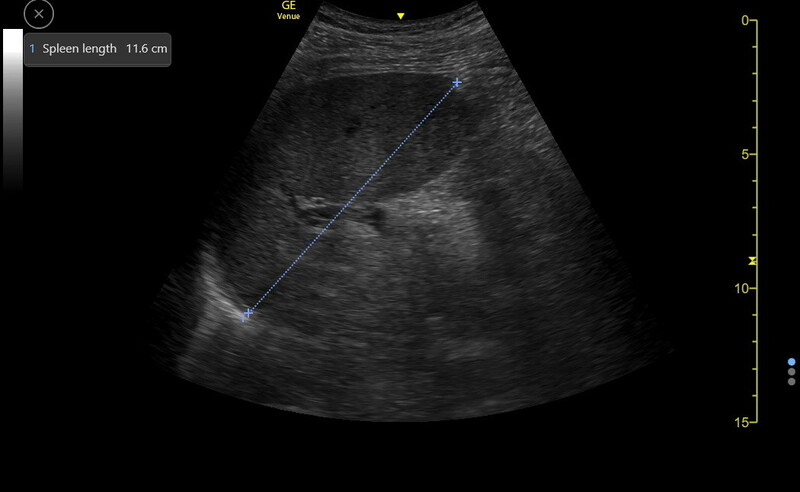 Here is an excellent still image of the SpV coming over the superior mesenteric artery (SmA) with the pancreas anterior to the SpV. Gas from the bowel and stomach obscure the pancreas out to the patient’s left. 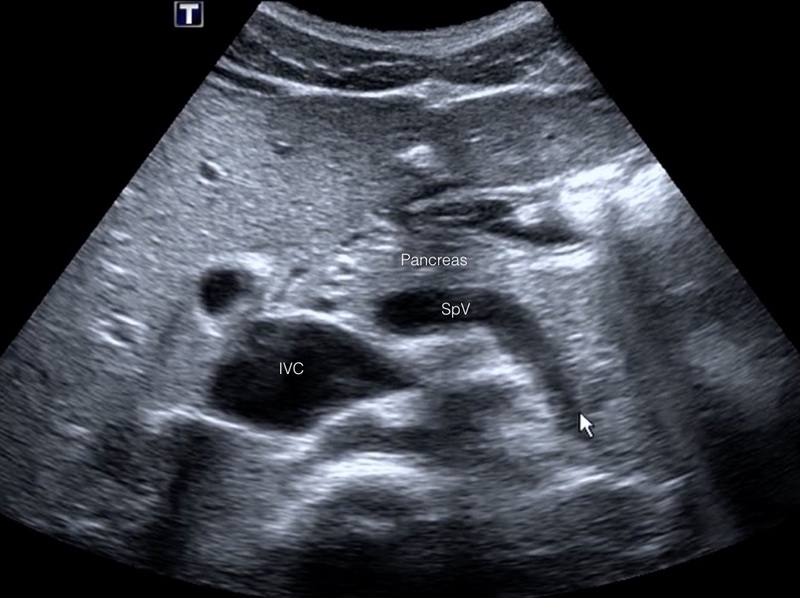 Here is a clip showing the SpV coming over the SmA with a normal pancreas anterior to the SpV. As in the previous case, stomach contents are obscuring the pancreas at the distal body. Once the pancreas is identified, subtly angle caudad and to the patient’s right and then left to see as much of it as possible. The antrum of the stomach almost always cuts off the tail. The pancreas is about 2-3 cm deep throughout but it is thicker in the tail. The tail of the pancreas can only be seen from a left lateral intercostal view where it lies caudad of the spleen and anterior to the left kidney as shown in the following image. This is a difficult view to obtain without an empty stomach, so details of performing this part of the exam will not be covered. Acute pancreatitis usually causes ileus, which can make viewing the pancreas more difficult. Inflammation causes edema, resulting in an enlarged, hypoechoic pancreas. Here is a case of diffuse, acute pancreatitis. 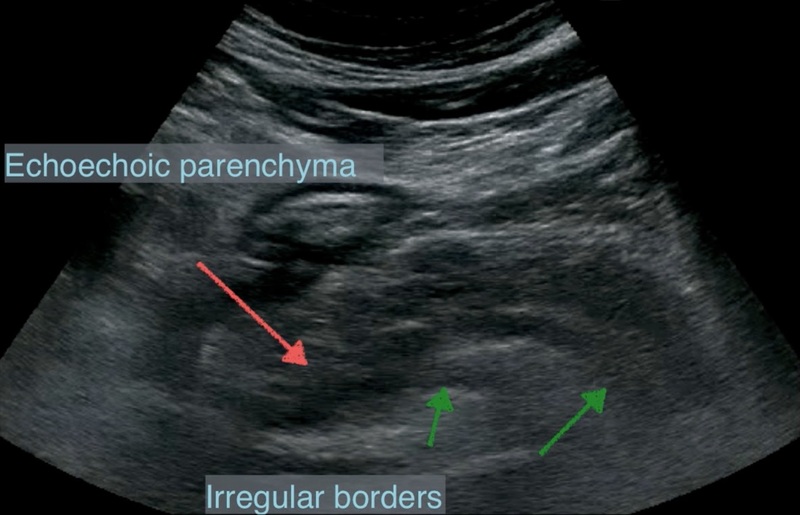 Pancreatitis can also be patchy and focal, in which case there is inhomogeneity of echogenicity, as in the following case. More pertinent for the clinic are the later complications of pancreatitis, such as chronic pancreatitis and pseudocyst. Chronic pancreatitis is notable for the appearance of calcifications and increased echogenicity in the pancreas. The following case easily shows the calcifications. Another characteristic feature of chronic pancreatitis is dilated pancreatic ducts, which may look like vessels, but show no flow with color flow/power Doppler. Here are some dilated pancreatic ducts in chronic pancreatitis, along with calcifications. 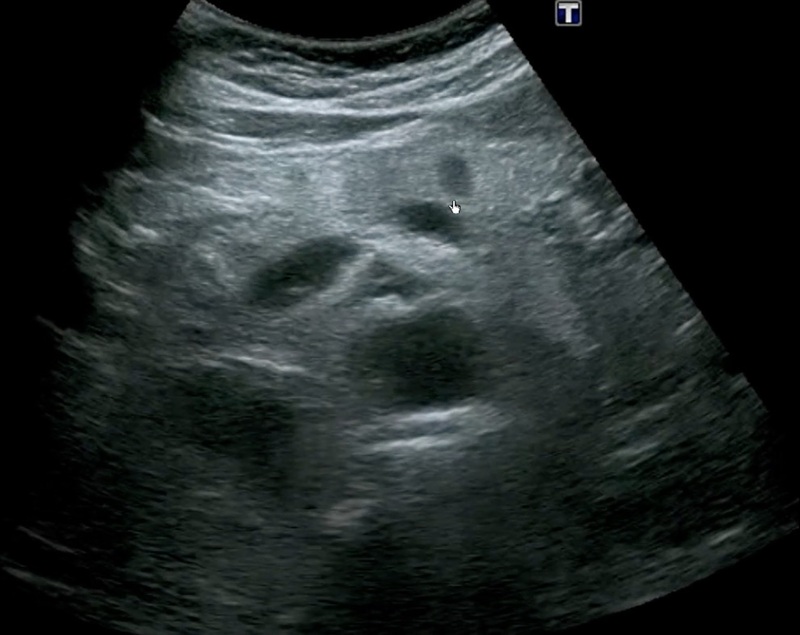 A classic complication of pancreatitis is pseudocyst. Sometimes it is an easy diagnosis as in the following case of a 40 year old woman still having pain after a second episode of acute pancreatitis. This is obviously a large pseudocyst that was drained endoscopically into the upper gut with a stent. However, cysts in the pancreas may be true cysts, including several benign types as well as mucinous cystadenocarcinoma and intraductal papillary mucinous neoplasm (IPMN). Thus, the details of the clinical situation are important for the diagnostic decision making. Here is a multi-lobed cyst in the head of the pancreas that could be benign or malignant. Tumors of the pancreas can be benign (cystadenoma or endocrine) or malignant (adenocarcinoma, cystadenocarcinoma, lymphoma, and neuroendocrine). This differential diagnosis makes solid lesions in the pancreas challenging. There is no information about US screening of the pancreas for neoplasm and certainly no information about how many benign lesions are worth investigating in order to find an important malignant one. Still, as the epigastric area is examined as part of the liver region exam, potential pancreatic neoplasms may be seen. Here is a patient with a hypoechoic mass in the head of the pancreas. It was greater than 2 cm so the prognosis was not good. This next large hypoechoic mass was in the distal body and tail of the pancreas. It is possible to detect a pancreatic cancer at a stage when it is resectable for cure (< 2 cm with no nodes). That was the case in the following patient with a smaller, hypoechoic lesion in the body of the pancreas. Identifying the extent of gastric filling is an important issue for anesthesia, but a smaller issue for internists. However, sometimes there is concern for gastroparesis or whether a patient with pancreatitis, bowel obstruction, or even enteritis might have a full stomach, potentially in need of a nasogastric tube. 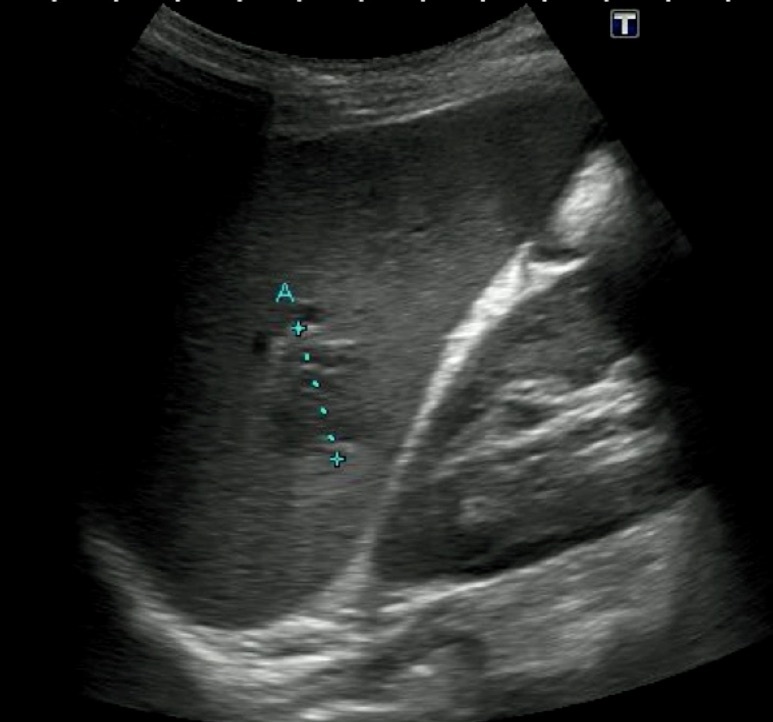 The technique for assessing gastric volume was developed by physicians in Belgium and Canada and images from their joint website are used below [gastricultrasound.org]. Don’t use this exam with stomachs that have been surgically altered or when a large hiatal hernia exists. The information below is mostly for reference because detailed assessment of stomach contents won’t be needed often enough for the specifics to be memorized. The gastric antrum accurately reflects the content of the entire stomach and lies between the liver and the pancreas, usually in a fairly anterior position. The white line shows the approximate scan plane for this parasagittal exam. The antrum has a characteristic multilayer wall with a thin, hyperechoic, outer serosa (seen only with a high frequency probe in the fasting state). The standard curvilinear probe in an abdominal mode will usually just see the thicker, hypoechoic outer muscular layer as is seen with the duodenum. For the liver region exam, the antrum was minimized by having the patient in the left lateral position. Now, the focus is on dilating the antrum so the patient is in the right lateral decubitus position. Scan the left upper epigastrium longitudinally looking for the antrum near the upper part of the liver, but below the colon. The following images are taken from the website [gastricultrasound.org], but the site itself also has excellent clips for further reference. Measuring the antrum: To get fancy, use the calipers in manual mode to measure area. Trace around the outside of the visible antrum as in the following image. There is a big table on the website or a fairly simple equation, listed next. These volumes are then divided by the body weight in kg, which should probably be ideal/lean weight rather than actual weight since obesity doesn’t enlarge the stomach that much. Volumes ≤ 1.5 mL/kg are compatible with baseline gastric sections. Volumes >> 1.5 mL/kg hours after eating are worrisome for gastric retention. The spleen can’t be seen through the anterior abdomen because of the stomach. The spleen is semilunar or triangular in shape and lies obliquely next to the ribs in the posterior left upper quadrant. The splenic hilum, where the SpV and the splenic artery enter and exit, is on the medial surface of the spleen. The patient should be in the right lateral decubitus position. Sometimes inspiration or expiration will optimize the views. 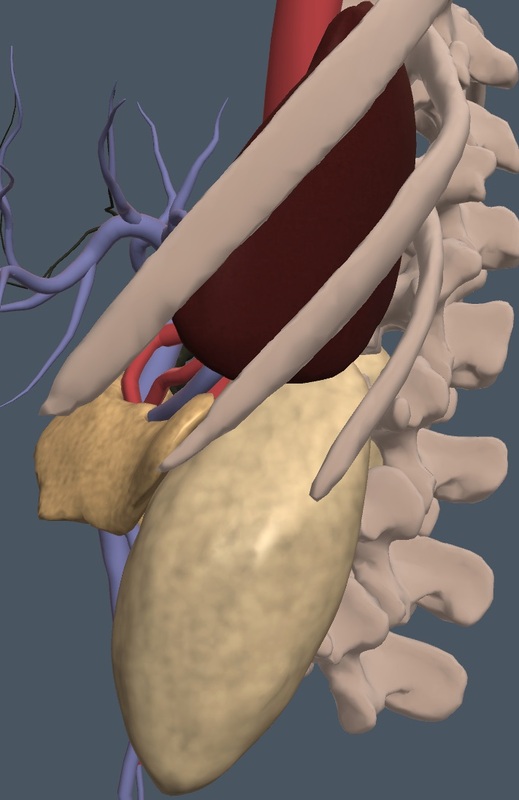 Here is the anatomy view of the splenic region as the probe would view things with the patient in the right lateral position. Use the intercostal spaces to locate the spleen because they are oriented roughly in the long axis of the spleen. The most caudad intercostal space at the anterior to mid-axillary lines usually locates the left kidney view, which is covered in the next chapter. One or two intercostal spaces cephalad with a slide toward the posterior axillary line will locate the spleen. 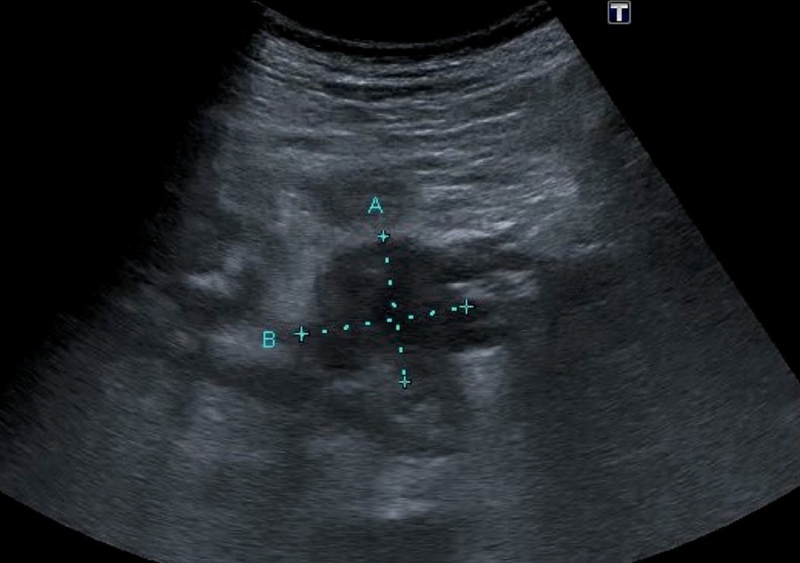 Make subtle adjustments of the probe to maximize the long axis view and bring in the splenic vessels at the hilum, as in the following example. Color flow/power Doppler can be used to be sure the vessels are in view. 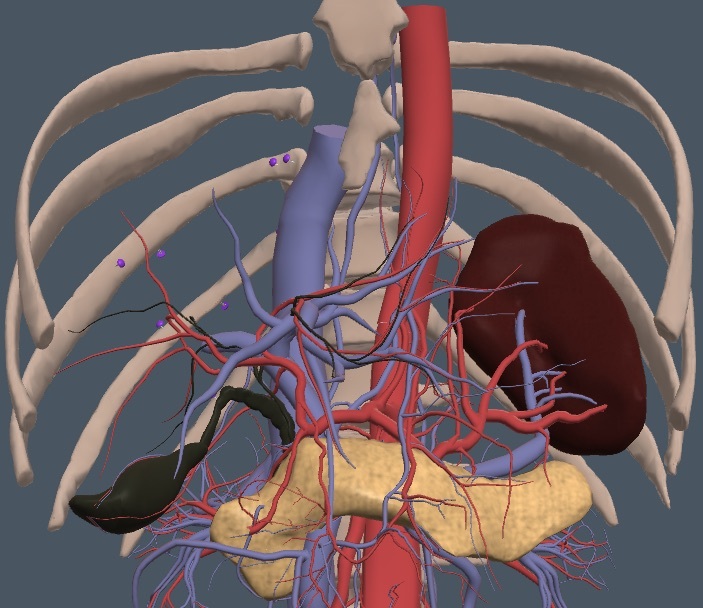 Even with increased depth, the entire spleen may not fit the screen in long axis view for measuring. But, after fanning and rotating the image, a first measuring caliper can usually be placed at the cephalad end at the diaphragm and then the second caliper placed out about where the caudad end of the spleen has been seen. 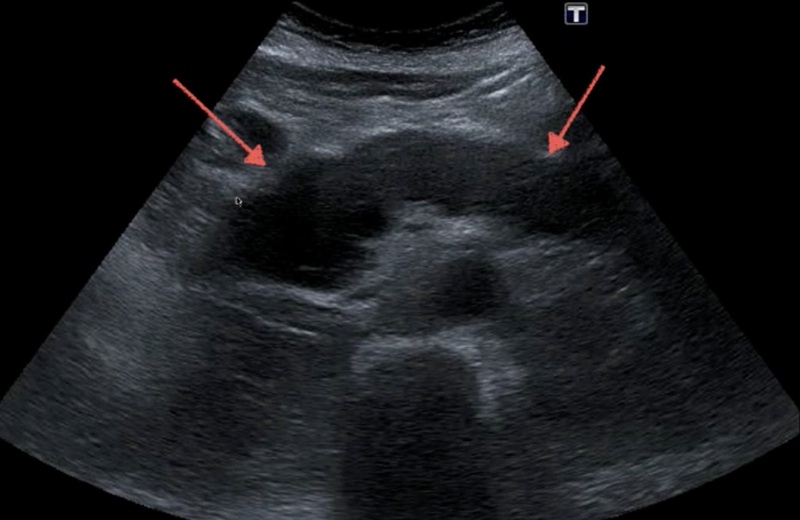 In the normal example above, the caudad end of the spleen (top right of the image) was out of view. Next is a spleen that was fully in view and measured. The spleen varies with patient height, but spleens < 12 cm in length are clearly normal, 12-16 cm length is mildly increased, 17-20 cm is moderately increased, and > 20 cm is severely increased. There are also normal dimensions for splenic width and thickness, but the length is the most important dimension. 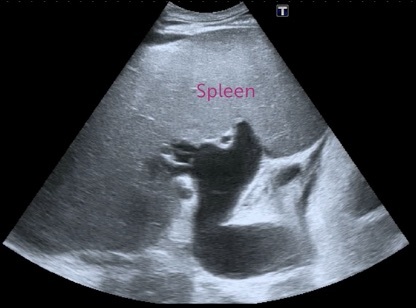 The spleen also “rounds up” as it becomes enlarged. A spleen that extends below the left kidney is clearly enlarged. 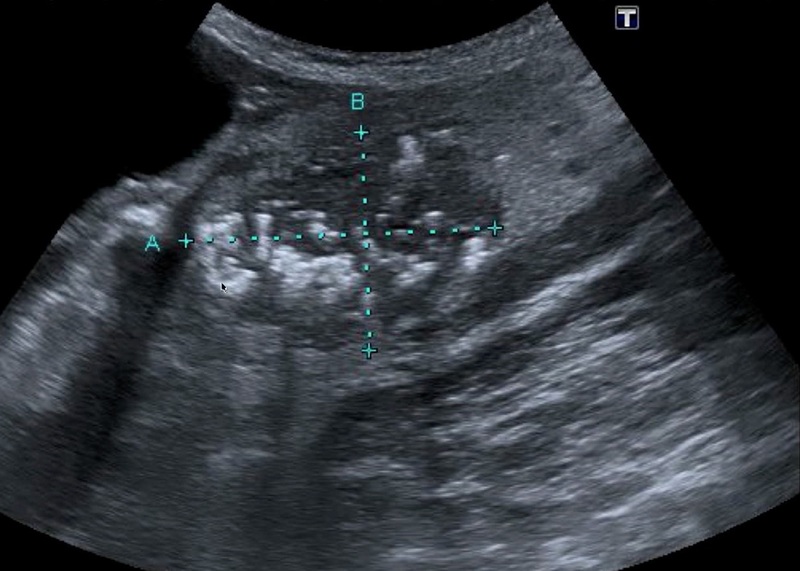 Here is a clip of an enlarged spleen that easily extended below the left kidney. Fan through the spleen in long axis confirming that it is homogenous in appearance with few visible vessels. The normal echogenicity of the spleen is greater than the liver and therefore also normally greater than the kidney cortex, as seen in the image right above. This is not steatosis of the spleen. 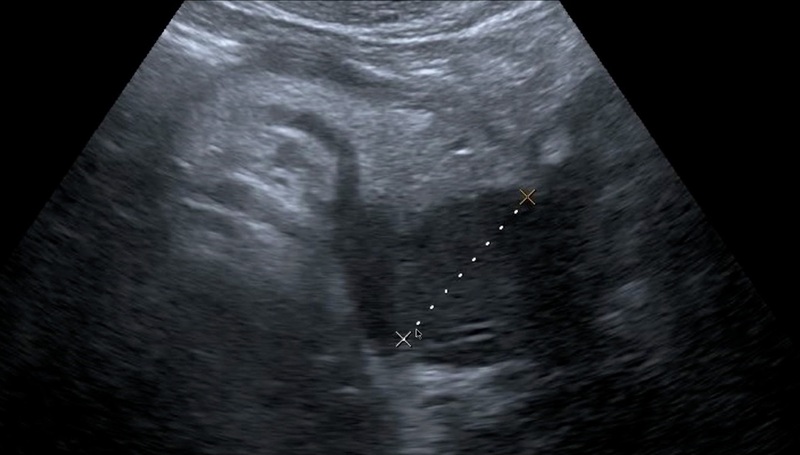 The splenic vein may be enlarged at the hilum in patients with portal hypertension, as in the following example. Also near the hilum are accessory spleens, which are not rare. They are usually small, round, and isoechoic with the spleen. Their importance only arises when splenectomy is being considered. 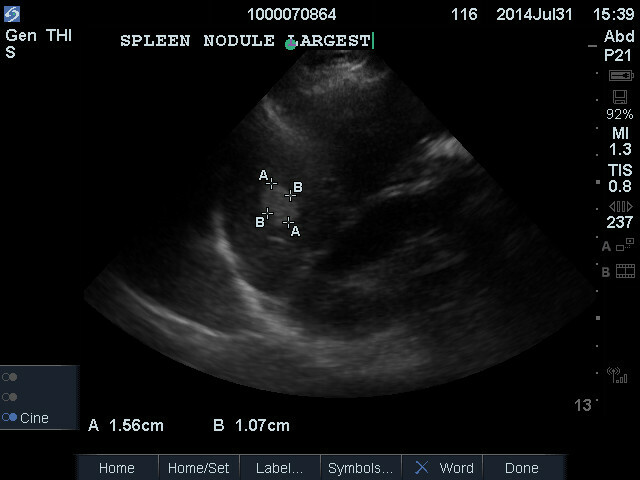 In the example below the accessory spleen is just above and to the right of the hilum in the image. Enlarged lymph nodes near the hilum can resemble accessory spleens. Overall approach to splenic lesions: this follows the guidelines from the American College of Radiology. An asymptomatic patient with a pure, simple cyst should have benign disease. A single, short term follow up IMBUS exam to detect size change would be reasonable. Single, strongly hyperechoic lesions with smooth borders should be benign hemangiomas. Hyperechoic lesions with hypoechoic rims are worrisome for malignancy. Ill-defined splenic lesions that are greater than 1 cm should go directly to CT or MR.
Cysts of the spleen may be acquired and benign, as in the liver. Here is an example. 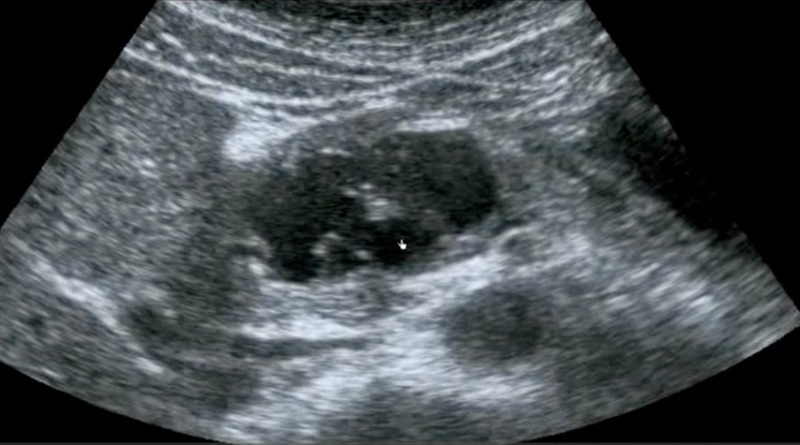 However, cysts may also be post necrotic, infectious, and even neoplastic, so the accompanying clinical features are important to consider. Hemangiomas of the spleen occur and are hyperechoic (snowball in the spleen), as in the liver. Single, hyperechoic focal lesions are benign the great majority of the time. Metastatic lesions in the spleen are rare, but are occasionally hyperechoic, with a hypoechoic rim (target sign), so we look carefully at hyperechoic spleen lesions. Splenic hamartomas are benign lesions that may cause concern about malignancy because they have hypoechoic areas and only further imaging with CT/MR will sort this out. These are also called splenomas. Here is an example. Calcification in the spleen is caused by a large number of conditions. Some of these are the resolved phase of a disease, but occasionally unusual chronic infections or even sarcoma and lymphoma can have calcification. The rest of the clinical findings become important to figuring this out. 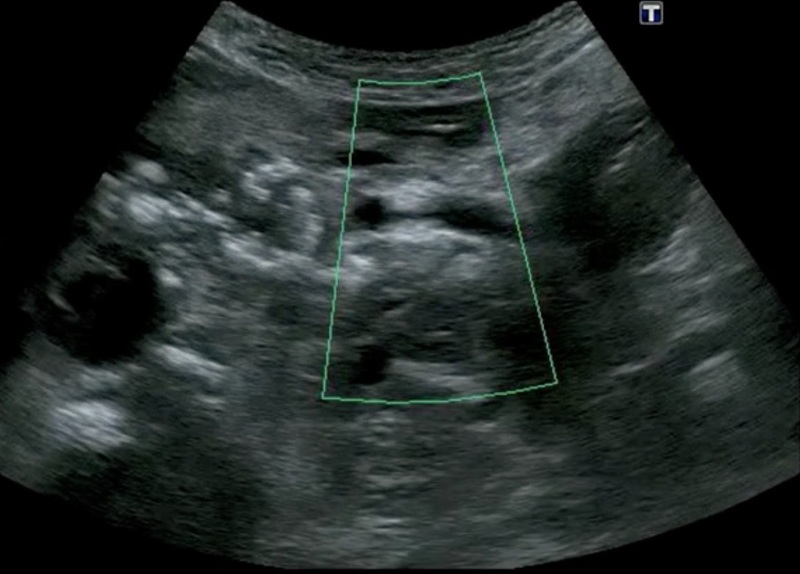 Here is a clip from a typical case of splenic calcification. Infarction and Hematoma: Acute left upper quadrant pain could be a splenic infarct from an embolus. A pyramid-shaped lesion with its base at the capsule would be typical. 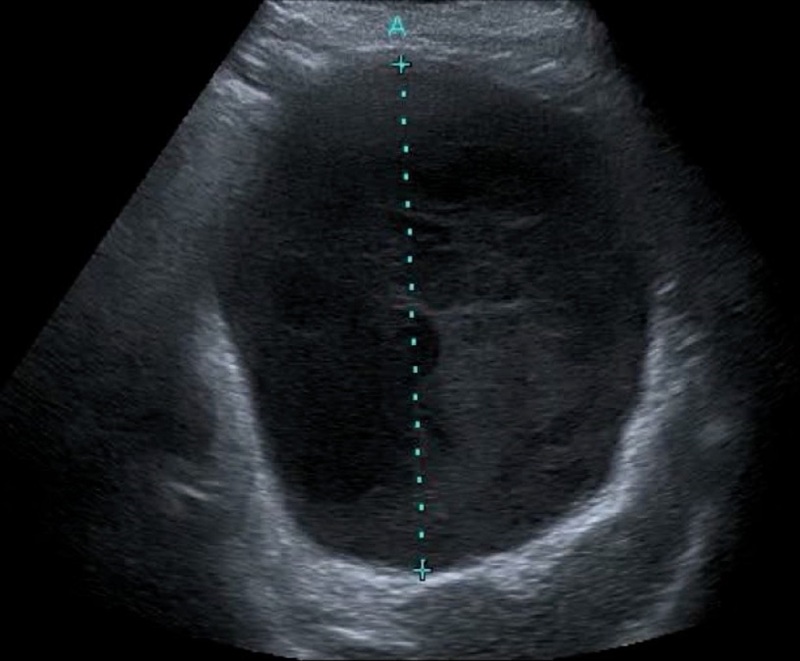 Acute lesions are hypoechoic, but older lesions become more echogenic. An acute/subacute hematoma would be a more peripheral area of the spleen with a density different from the normal parenchyma. Acute hematomas are hyperechoic.